I wore this to the mall the other day and loved it so much that I thought I’d do a little “Outfit of the Day” post for it. I usually don’t like to just post outfits for the sake of posting outfits. I like there to be a larger point to the post than just, “look at how cute I was today!”, but I got a few requests to get a better look at the vest from my last post, so I took some photos. Then, I came across a photo of the un-altered vest on my little petite dress form that I completely forgot I tweeted when I first bought it. Since the dress form is pretty close to my actual measurements (it’s longer waisted than I am, but still pretty similar), I realized I might be able to put together an “Adventures in Alterations” post on this little guy after all! So, here we go! As I wrote in my first post about this little vest…I was OBSESSED! It didn’t come in petite sizes, and I knew if I picked it up, it would be doosey to alter. So when I was able to score a regular size 0 for a mere $2 thanks to great sales and Rewards Cards, I decided I loved it enough to pay for the alterations it was going to need. 1. Regular sizes are longer than petite sizes, so the shoulder, bust placement, arm hole and waist placement are all either too long or too low. Taking up the vest at the shoulder will bring all these things higher. However, taking up the shoulder means the fabric along the back of the neck needs to be re-cut. 2. The width is too wide and needs to be slimmed. Slimming the sides will also help to narrow the arm hole. Getting it slimmed was pretty obvious, but most petite women don’t realize the difference taking a garment up at the shoulder can make! We’re short…so our clothes have to be too. Taking the vest up at the shoulder made the arm holes nice and high, put the bust in the right place, and made the vest end at a much more flattering length. Moral of the story…if you really, really love something, don’t be limited by the fit right off the rack. Make sure the quality is worth it, that it’s truly your personal style, and search out the best deal you think you can get. There’s nothing wrong with paying a little bit of money to get the perfect fit on a garment you really love. OMG what a HUGE difference! It looks amazing post-alterations! WOW. I am like in awe!!!! It looks custom and it’s sooooooo YOU Kelly! LOVE it! Ahh, yes…the infamous “only looks good because it’s pinned” trick. Those displays should come with a disclaimer. “Get this look after $60 worth of alterations”. The alterations created such a lovely shape! 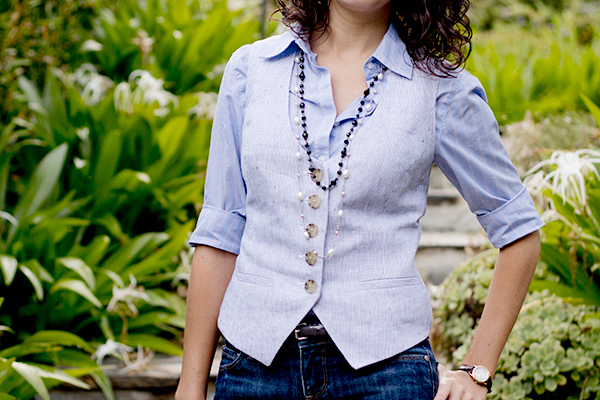 I love that the buttons on this vest are not a metal…makes jewelry pairing so much easier! Good point about the buttons! I like the light color of the buttons too. 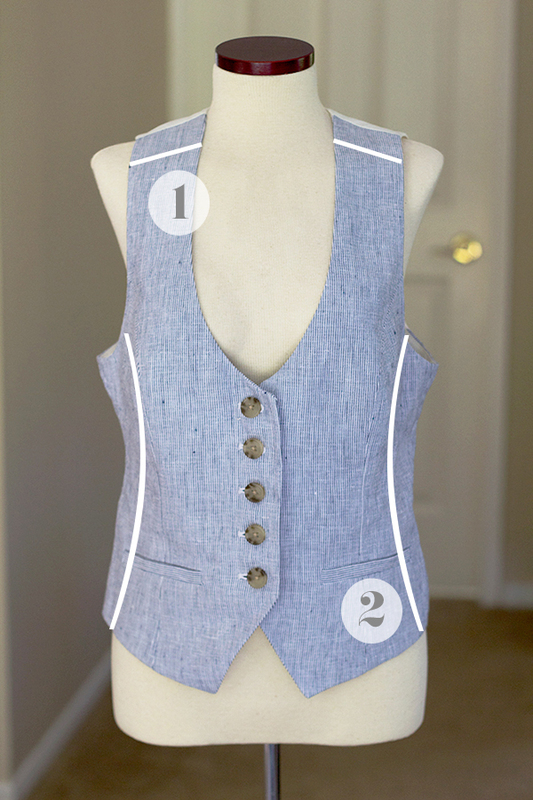 Together with the light blue stripe, it makes the vest feel very light and summery. 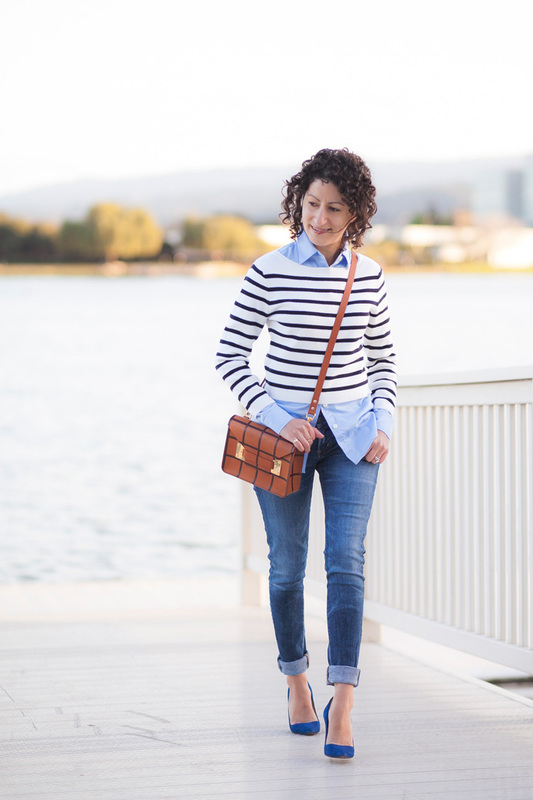 This outfit is fabulous – casual but chic. 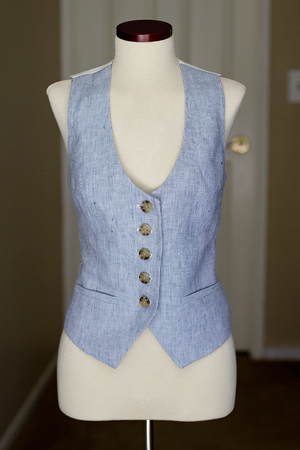 The vest is amazing – it really is fantastic what tailors can do. I always notice you wearing button-downs, do you have any recommendations on where to buy them. This petite’s had no luck so far. Thanks! Ugh. Button downs are tricky. H&M has some stretchy ones that will fit if you’re long waisted, but on me, they bunch up like crazy at the shoulder (because the waist of the shirt shimmies up to sit on my natural waist). My LOFT one was altered, but I really loved the shoulder detail, so I felt it was worth it (and it was! I wear that thing all the time). 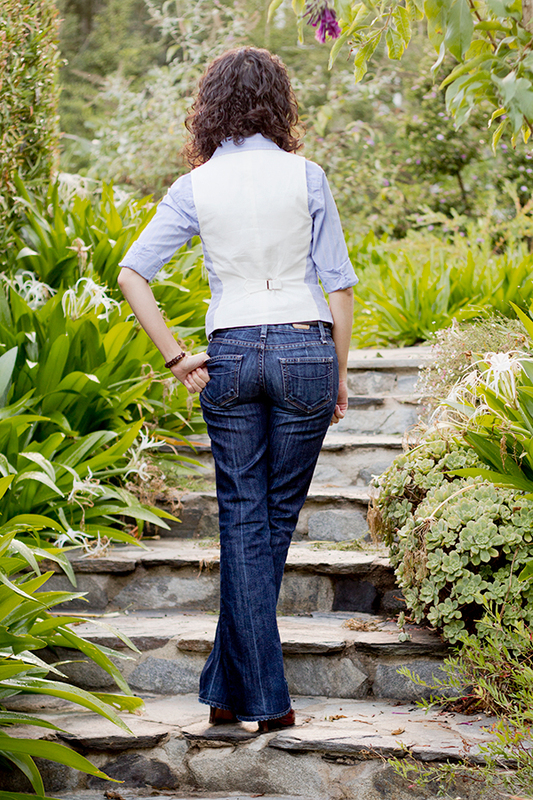 The BR button back blouse I’m wearing here is unaltered, but the pleating at the back gets poofy. I’m thinking about taping the pleats down with fashion tape if I wear it alone. Thomas Pink fits really slim, but again, only good if you’re long waisted (I get the shoulder bunch). Honestly, my take on button downs is: if you want a nice button down, choose your color and detail options, and find one that 1) is a nice fabric 2) fits in the shoulder 3) won’t need extensive sleeve alterations. If you can find a shirt that meets those criteria, but it’s a little wide, just have a tailor take it in. If you get shoulder bunch on a button down, you can’t alter that easily, even if it fits at the waist. It’s better to have it fit wide and get it tailored down to your size. Love it, it’s so you! I’m curious, is there anyway to style this vest unbuttoned and still look chic? I almost bought an H&M vest after seeing your last vest post and Elle’s but refrained because I couldn’t think of way to successfully pull it off unbuttoned unless the vest was oversized. The before & after look so different! Cute vest. I bought one a while back, but can never find anything to match… It always end up looking weird on me. >_< Anyway, love love love the jeans! Have you tried it under a blazer? That’s how I first started wearing them, and it’s an easy way to style. What a difference, Kelly! You do menswear-for-ladies so well. My daughter has a similar button-back too (Children’s Place) from last fall and loves wearing it. It looks great! And I like your gratuitous outfit shots. huge vest fan myself. both of mine are on the darker side. 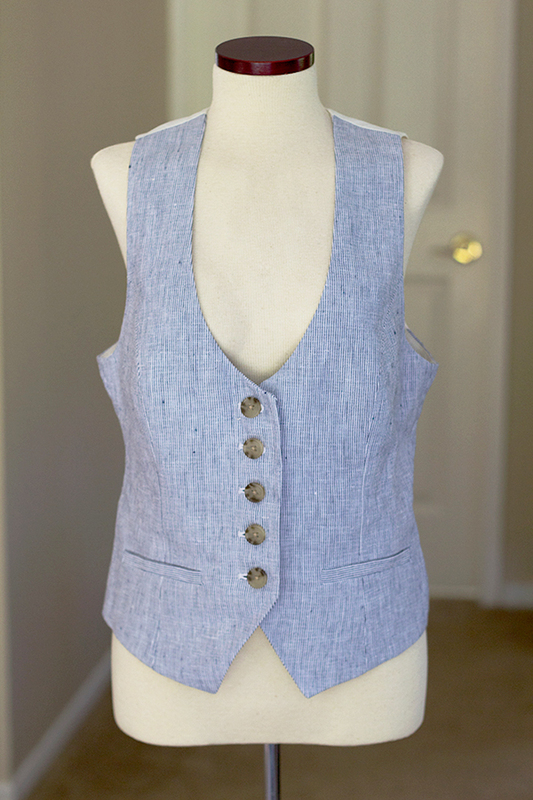 This lighter color vest is great for casual looks as well as more formal/professional looks. Have you seen the menswear vests at H&M? Size 2 fits really small! I picked up the brown checked one but am having a hard time figuring out what to wear it with. It looks amazing! I’d LOVE, LOVE, LOVE a vest like this in a plaid, light-to-medium neutral grey colour. That is practically PURE MAGIC. It deserves a round of applause. Looking great as always Kelly! The few small alterations make all the difference. I LOVE the wash on those Paiges too! I love the wash of those jeans! Do you know what its called?? It looks so much better after the alterations! Being fairly small myself (5’3″) I often have this sort of problem (the waist on garments being too low and the length too long.). Thanks for a simple solution :). See my own clothes alterations at http://andhavingwritmoveson.blogspot.fr . I’m only just starting out so tips are welcome.